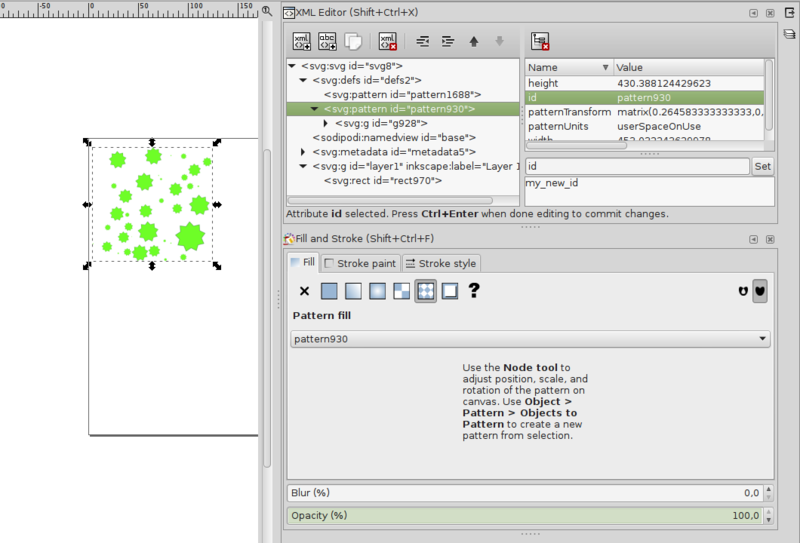 I created a pattern in Inkscape but its name is not really meaningful. And when there are more patterns in one document, it will be hard to remember which one is which, since there is not visual representation in the dock. Is there a way to rename the pattern easily, without having to dive into the XML editor and manually replace the id and references? You would need to use the xml editor for that. Open it, look into the 'defs' section, and there change the id of the pattern. As a consequence, you will need to reapply the pattern to all the objects where it is used. On the picture below, you would still need to click on 'Set' to change the pattern id. Make sure the name only contains characters that can be used for an id in CSS/SVG (no spaces, best restrict yourself to a-zA-Z_-). 1) Create a file in which you define all the patterns necessary for next use. Let's say "patterns.svg". 2) Then, open this file with a text editor and look for the <defs>...<defs> section. 4) Change the "id" and "inkscape:stockid" accordingly to the names you will remember. 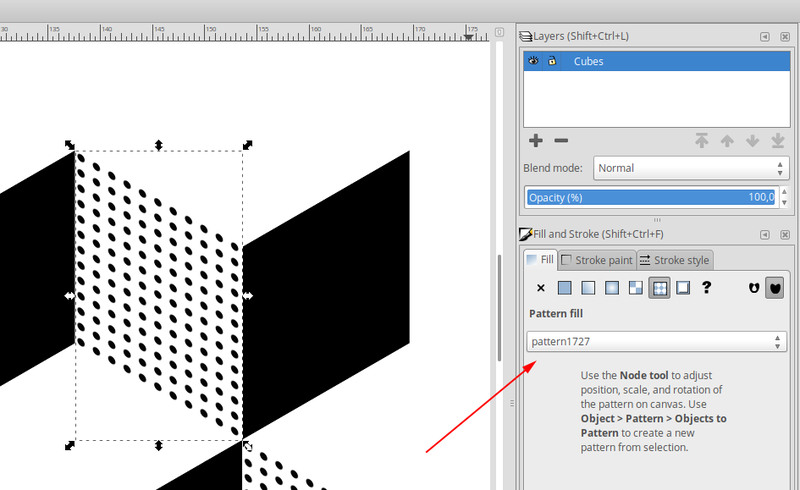 6.1) Open this file every time you need to apply these patterns and copy and paste them to your new drawings. 6.2) Open again the file with a text editor, copy the content inside the <defs>...</defs> tag and append it to the <defs>...</defs> tag on ../share/patterns/pattern.svg . Doing so, you will have these patterns available every time you open inkscape on "fill and stroke" > fill tab > mesh gradient.